The Metro BBQ Tote stands out among other portable barbecue tool sets. 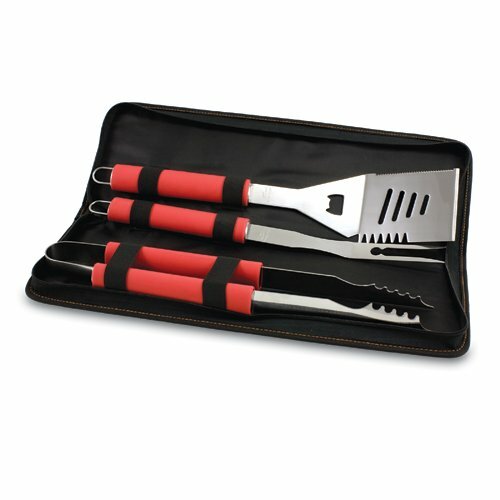 It's a 3-piece BBQ tool set with red silicone handles in an attractive black polyester zip-up case with an adjustable red shoulder strap to match the handles of the tools inside. It includes three stainless steel tools: 1 large spatula featuring a built-in bottle opener, grill scraper, and serrated edge for cutting (17.5in) , 1 BBQ fork (17in), and 1 pair of tongs (16.5in). All three tools have long handles to keep your hands away from the flames and metal loops at their ends to hang them on your barbecue.